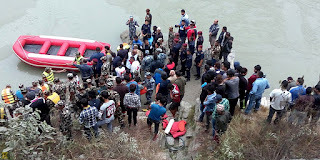 Early today morning at 5am one night bus NA6KHA 1467 fell in Trishuli River near Gajuri ghat. Bus was heading from Rajbiraj to Kathmandu. Rescuers have recovered 16 bodies from the river, out of which nine are male, five female and two infant. Their identities are yet to be ascertained. 17 passengers managed to save their life by swimming to the river bank. They are all injured. Around 2 dozen people are still said to be missing. Total number of passengers that were in the bus is yet to be ascertained. Rescue work is going on.